Filling the space between the bars. I pretty much followed the directions from guide, modifying a few things here and there. For instance, instead of foil, most of my bottles are wrapped in a layer of newspaper and plastic. To hang the bottles, I bought some string from the local hardware store and taped it along the sides and tops of the bottle. At the top, I knotted each of the 4 strings and taped it up with duct tape. I then took 2 paper clips and attached them to the end to make a hook. 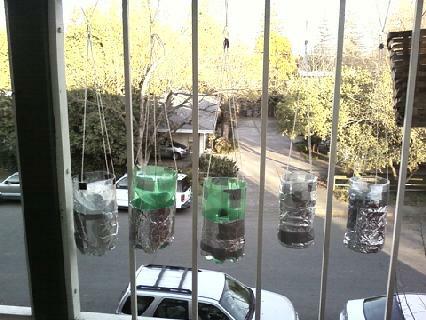 I use the paper clips to hang the planter from string I tied to my balcony. I chose to do it this way to make it easy to remove and replace the planters from the balcony (any pot can go to any node). It makes maintenance so much easier. The string has holding up, even in wind greater than 20 mph, so I will consider this project successful. The only issue I've been having is that the shadow these planters create block out a lot of sun from my other plants.